Abstract: With regard to the air condition, Airwheel self-balancing scooter is such a clean and eco-friendly transport without any pollution, which has great significance for environment protection. Starting from riding electric unicycle, let’s clear up the air. Airwheel intelligent scooter, due to the use of electricity as power, is regarded as a "zero emission transport”. Now, takes a look at the means of transport people use. There are the car, the bus, the metro and the electric bike. Among them, the car is used by most of the people. Powered by fuel, the exhaust gas is being emitted to the air in more and more amount and forms the serious pollution to the atmosphere. Zero emission is what the human being needs most. Once upon a time, enjoying the fresh air is a fundamental right of everyone. However, after the rapid economic development, people have taken the environment as the price. People themselves have destroyed everything. For many people living in the city, only in the weekend, going to the park or the suburbs, they could breathe the clean and fresh air. It is no exaggeration to say that air quality has seriously affected people's happiness. Airwheel 2-wheeled scooter appears appropriately. As a matter of fact, the leaders in the auto industry have realized that their own disadvantages long ago, and also began to develop hybrid electric car and pure electric car. However, in the present situation, the clean and fresh air is an urgent matter. Airwheel electric scooter is compact and agile, and can passes through any narrow space. Therefore, it is less likely to be congested in a traffic jam. 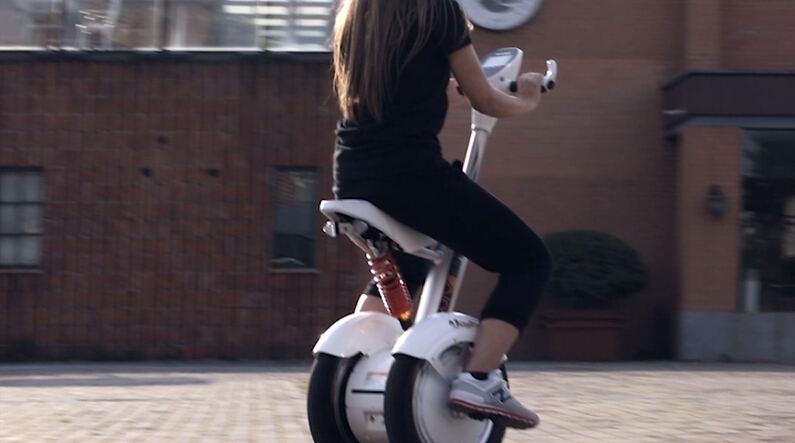 In addition, Airwheel intelligent scooter uses a lithium ion battery, which can be ridded for about 20 kilometers without producing any emission. During the use of Airwheel self-balancing scooter, there won’t be any harm to the environment and atmosphere, which proves that Airwheel is a very environmentally friendly product. One more car owners choose Airwheel, less air pollution there will be. If everyone wanted to breath the clean and fresh air, choose Airwheel intelligent scooter. To the air condition now, it has a very important significance for environmental protection to use clean and green transport. Air, though no color and no smell, plays a very important role in people's life. No one can leave the air. In this case, let’s clean up the air again!